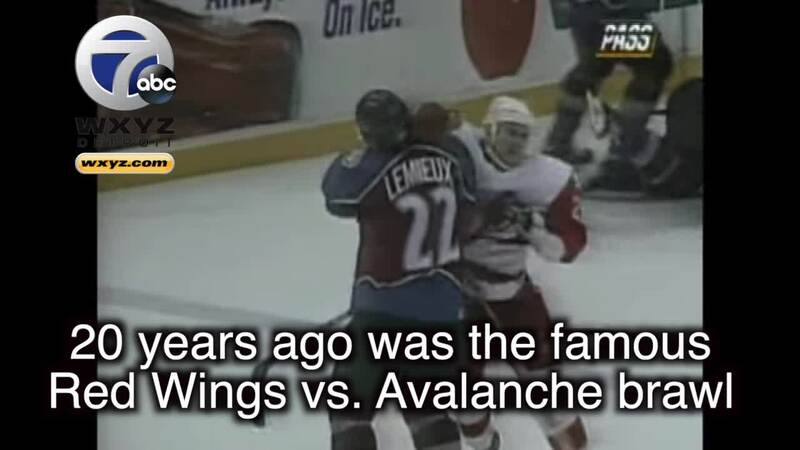 DETROIT (WXYZ) — March 26, 1997: A day that will long live in the minds of Detroit Red Wings and Colorado Avalanche fans. That's the day when the two teams squared off in one of the more famous brawls in NHL history. It all got started 301 days earlier during game 6 of the Western Conference Finals. Claude Lemieux hit Kris Draper from behind, slamming his face into the boards. It broke Draper's jaw, nose, cheekbone and gave him a concussion. Detroit ended up losing the series and failing to make it to the Stanley Cup Finals. Lemieux wasn't in the lineup the first two times the teams met in the 1996-97 season, and nothing big happened in the third game. Then came the fourth game on March 26, 1997. "When it all exploded at The Joe," Draper wrote in a Players' Tribune article. "You could feel it in the dressing room before the game. You could feel it during warmups. They were 3-0 against us that season," he wrote . "They were No. 1 in the division. This was our last game against them going into the playoffs. It was a huge moment." Near the end of the first period, mayhem ensued. It started with Igor Larionov and Peter Forsberg scrapping near the benches. Then, it happened. 301 days after Lemieux broke Draper's face, Darren McCarty went after him. Throwing punch after punch, Lemieux turtled on the ice and The Joe went wild. "I look to center ice, and there's Mac. Darren McCarty, the guy who visited me in the hospital every day," Draper wrote . "Mac is reigning punches down on Claude Lemieux right in front of our bench. Lemieux's helmet pops off, and he goes down on all fours, trying to turtle to protect himself." Avalanche goalie Patrick Roy skated from his net to protect Lemieux, but out of nowhere, Brendan Shanahan intercepted him at center ice, jumping and tackling him mid-air. Red Wings' goalie Mike Vernon gets involved, squaring off with Roy at center ice. Both guys land multiple punches. "Not just tying up, but throwing haymakers," Draper wrote . Other fights included Brendan Shanahan and Adam Foote, and more throughout the game. "When the refs finally got ahold of everybody, there were helmets and sticks and gloves and jerseys and blood all over the ice," Draper wrote in the article. "Exactly 301 days after I had my face caved in, my teammates stood up for me. We settled it," he wrote . "But this is what a lot of people don't remember: For the players on the ice, that night wasn't just about the fight. That night was about providing that we could beat Colorado on the scoreboard." The Red Wings eventually won the game 6-5 in overtime. The game-winning goal was scored by McCarty. In all, there were 148 penalty minutes handed down in the game. Brent Severyn had 20 for the Avalanche while Aaron Ward led the Red Wings with 15 penalty minutes.